It was time for a revolution. Or, at least, that’s how the story goes. Riding a wave of alternative hype that had been forged by the Smiths, and the Jesus and Mary Chain, alternative guitar music firmly rooted in the heyday of the British Invasion and the height of the psychedelic era had jangled into the hearts of millions in the United Kingdom. Gigantic walls of guitar noise and feedback, coupled with melodic choruses had finally worked its way into the mainstream, especially in larger cities, where, by the end of the decade, the alternative movement in Manchester had turned into Madchester, where psychedelic influences were being combined with danceable, pulsating club beats. This meshing of genres and ideas presented an opportunity for something that British music had not experienced in over twenty years: rejuvenation. Call it “a resurrection” of sorts. Needless to say, The Stone Roses self-titled debut was an overwhelming success, finding resonance in not only the Madchester movement, but was also a triumph commercially with the general public. Some proclaimed that the Roses were the second coming of the Beatles for the new generation; after all, the comparisons were plainly in sight – every track on their debut was a hit in waiting, their vocal overlays and light-as-air guitar melodies, hypnotic beats, and high as a kite choruses made every one of their songs concert and Hacienda club ready, while simultaneously remaining a pleasure to listen to on an individual level. However, success quickly presented itself as a double edged sword for the Roses, as the eight album deal they had signed with their label, Silvertone, was now in dispute after their new found success. Silvertone placed an injunction on the band that prevented them from recording with any other label for nearly a year at the height of their popularity. It would be more than half a decade before the Roses released their second full length album. 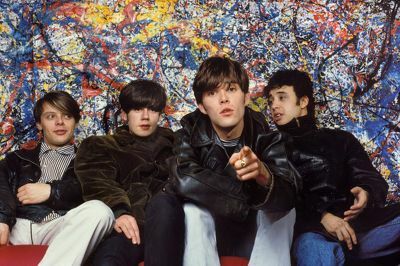 The Stone Roses brought hypnotic and psychedelic melodies together with lighter than air vocals and guitar lines – marrying the sheer musical genius of the Beatles with the new rave culture that was exploding in Britain in the late 80s. With the demand for new music from the Roses reaching new heights, Silvertone released Turns Into Stone, a full length, eleven track collection of non-album singles and B-sides that had been created during the recording sessions for their first album. Surprisingly, unlike a lot of songs that are relegated to B-sides, a great deal of the material on Turns Into Stone nearly matches up to the quality of the songs included on their debut. First track “Elephant Stone” shines out as one of the best gems from this collection, as it shimmers and rolls with almost unbridled joy; the kaleidoscopic drum rhythm meshing perfectly with the glistening guitar lines, all the while complementing the colorful lyrics that weave alongside. From there, the quick and punchy “The Hardest Thing in the World,” the relaxing “Mersey Paradise” and “Going Down,” the bluesy tinge of “Standing Here,” and the reverb-heavy chorus of “Where Angels Play” round out the first half of the album with not a single dud, each track would seem to have been prime candidates for inclusion on The Stone Roses. The second half of this compilation is more of a mixed bag that contains more of the Madchester/dance based beats shining through. The band continues its seemingly pointless fixation on playing one of their songs backwards, as “Simone” is just “Where Angels Play” played backwards with no added flourishes, and while “Fools Gold” and “One Love” remain classics of the era, their respective B-sides “What the World is Waiting For” and “Something’s Burning” often drag far past their surface appeal, not holding up nearly as well as their far superior A-sides. While The Roses sat on the sidelines trying to find the inspiration for their sophomore effort after the lengthy battle with their label, Britpop, the movement that they had helped to create, grew by leaps and bounds all around them. In an almost cruel twist of fate, the movement was now being led by those who had idolized the Stone Roses during their heyday. Ironically, the band who had proclaimed in 1989 that “we’re the most important group in the world, because we’ve got the best songs and we haven’t even begun to show our potential yet” had lost nearly all their relevance by the time their bloated and nearly forgettable second album Second Coming was released in 1994, and the band split apart soon after. What they left behind, their remarkable influence on an entire decade of Britpop via their legendary debut, and this outstanding companion compilation of non-album singles and B-sides, remains indelible.